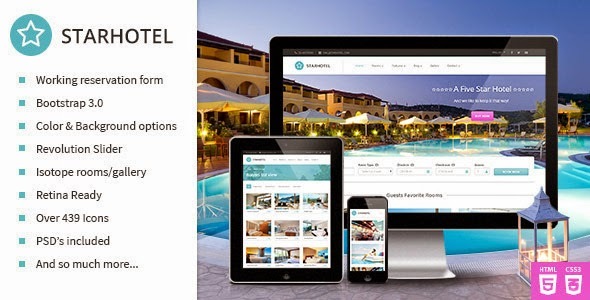 Starhotel is a responsive HTML5/CSS/jQuery site template Bootstrap 3.0. It’s not just suitable for hotels, but also for resorts, bed and breakfasts, hostels, motels, spa’s and so on. The layout is optimized for all devices(iPhone, iPad, Android) and it’s cross browser compatible. And last but not least: there is a WORKING RESERVATION FORM, where potential guests can request a booking! Item Reviewed: Starhotel Responsive Hotel Booking Template 9 out of 10 based on 10 ratings. 9 user reviews.